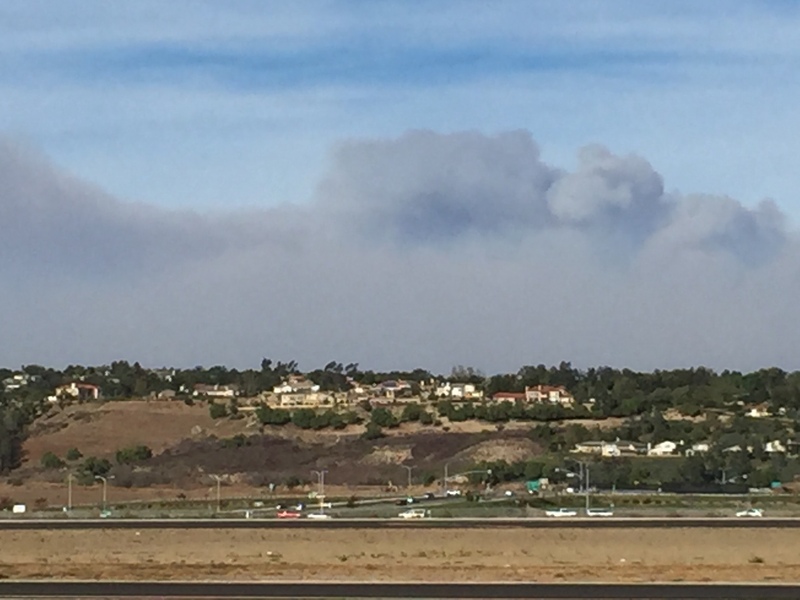 We’re fine – still nothing that close to us, although another new fire has apparently started up over to the east by Monrovia. Being Saturday, I was out at the hangar in Camarillo. The first big fire in this current sequence of six or seven fires started not too far from there and is still burning. For scale, from my house to the airport is about 35 miles on the freeway, almost exactly 25 miles as the crow flies. From my house to Carpenteria, on the far left edge of the map and just south of Santa Barbara, is about 50 miles directly. This is not a small area. It’s “local” by Southern California standards, but it could cover the better portion of several states in New England. 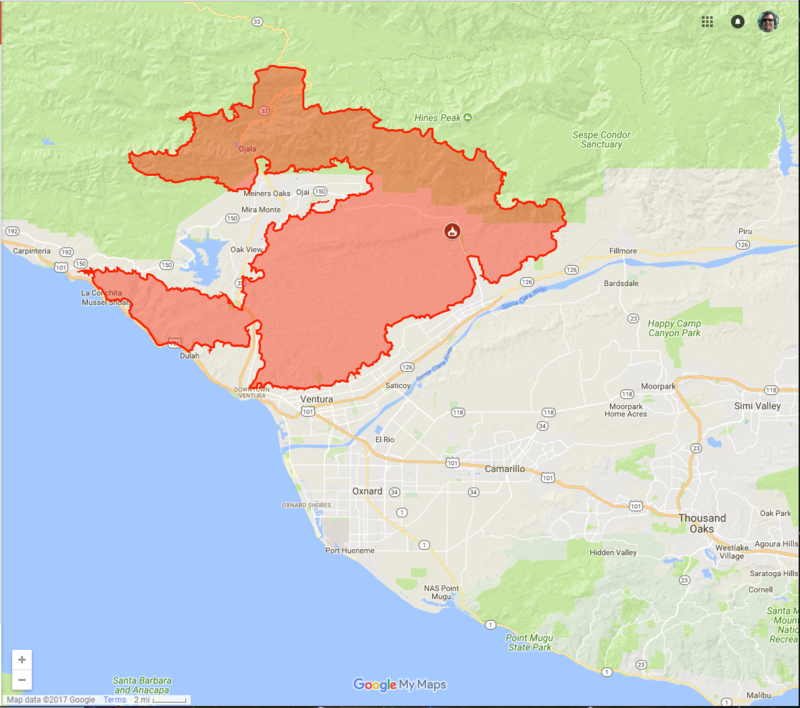 Map from Google and CalFire. Scale is similar to the one above. 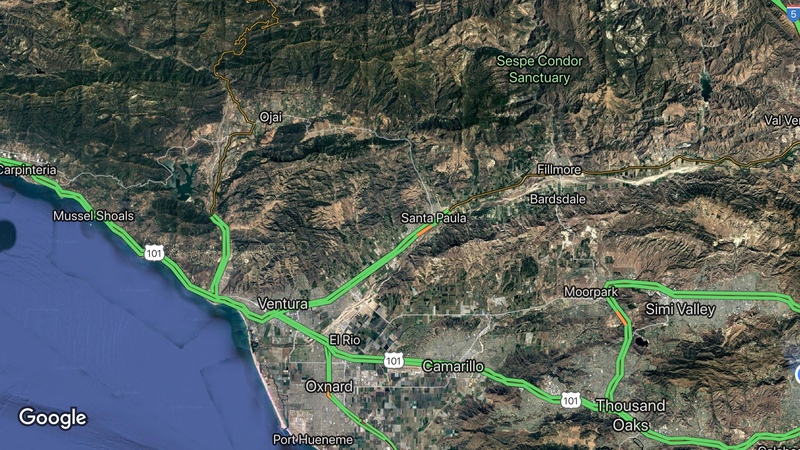 The fire started near Santa Paula on December 4th, spread toward Ventura, and is now moving up into the mountains and up the coast toward Carpenteria. 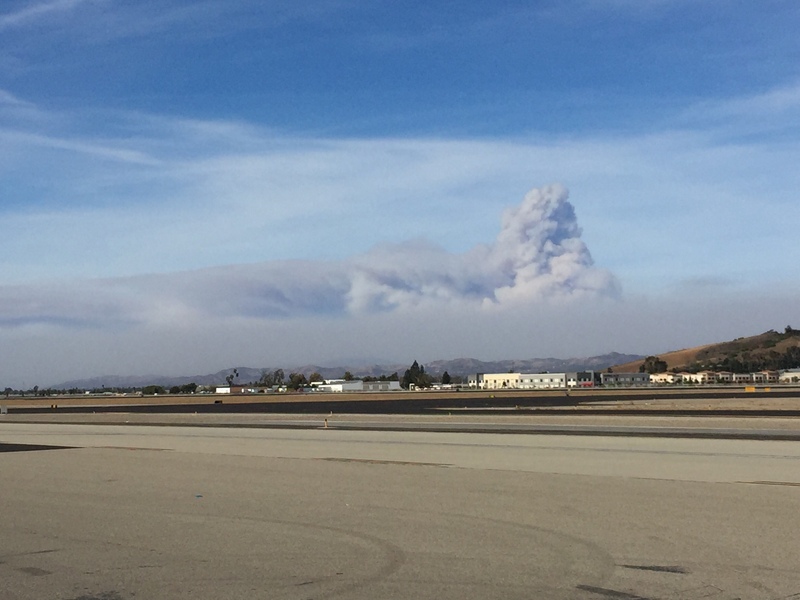 What’s that look like from the ground at Camarillo Airport? 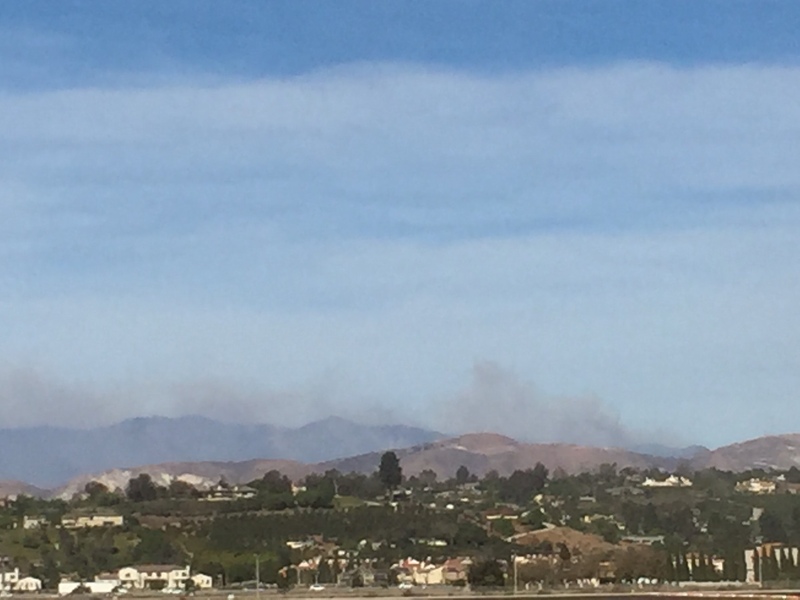 On the far left you can see the smoke plume from the main fire up toward Carpenteria. Straight ahead you’re looking up toward the Santa Paula and Fillmore area. When I got there this morning things had started to die down a bit overnight, but the winds were starting to blow again. By lunch we were looking at 30 mph winds with gusts to 45 mph. In the mountains and canyons where the fire was, it was worse. Naturally, this led to a number of flareups. I also learned that two of our CAF SoCal members lost their homes, burned to the ground. One of our members got out with literally just the clothes on his back, managing to get out in his wheel chair in the middle of the night when he woke with the house burning, finding his cars on fire in the driveway, and saved only because a neighbor saw him as they were bugging out and drove him to safety. The winds are supposed to continue into tomorrow and then start dying down in the next week, but there’s no rain in the foreseeable future and these fires are now pushing up into the mountains where they’ll be very difficult to fight. There’s a lot of brush after a very wet winter last year and most of these areas haven’t burned in decades. These fires may still be burning well into 2018. I remember when I lived in OC and Anaheim Hills was on fire. Standing there looking “So Cal north” and thinking what do you do if it starts moving toward the ocean. Go stand in the ocean until it burns out? It’s a little bizarre when you are surrounded by fire! Look at Ojai on that fire map – they’re in a war zone and surrounded!